With wispy green, grass-like foliage and charming pink-tinged, purple flowers, chives work beautifully as a low hedge. In my area (USDA Zone 6b), they’re a great three+ season plant. In the late autumn I allow the fallen leaves to cover them and by mid-March, they’ve lost all patience and grow right through the leaves! They’re not invasive (they will do some minor self-sowing if allowed to flower), but they clump nicely and can easily be divided to provide more plants. If they get floppy mid-season, they can be cut down (I use a weed wacker) almost to the ground and within two weeks, they will be full & lovely again. A big bonus with members of the allium family is that they repel quite a few pests (Japanese beetles & carrot rust fly) while attracting beneficial insects like bees and butterflies. They serve double duty when planted as a border around vegetable beds and are even reputed to discourage deer browsing. 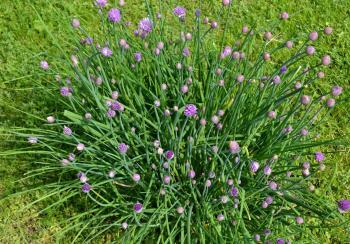 With bug-repellent properties and shallow rooting, chives make a great planting against a house or shed. Lush and full, yet easily removed and replaced for any building maintenance duties. Chives are perfect in mixed arrangement flower pots. They’re an easy and unique substitute for the over-played “spike” grass. Teamed with Rosemary, Rosmarinus officinalis, and thyme, Thymus vulgaris, you can make a gorgeous, easy-to-care-for, edible planter. I use chives in indoor and outdoor boxes. A sunny windowsill inside makes for a convenient and pretty supply of fresh stems and flowers for eating, and outside, they attract butterflies and the occasional hummingbird into easy view. Grown easily and very affordably from seed, chives should be on your go-to list, too! Copyright text 2018 by Garden How To.